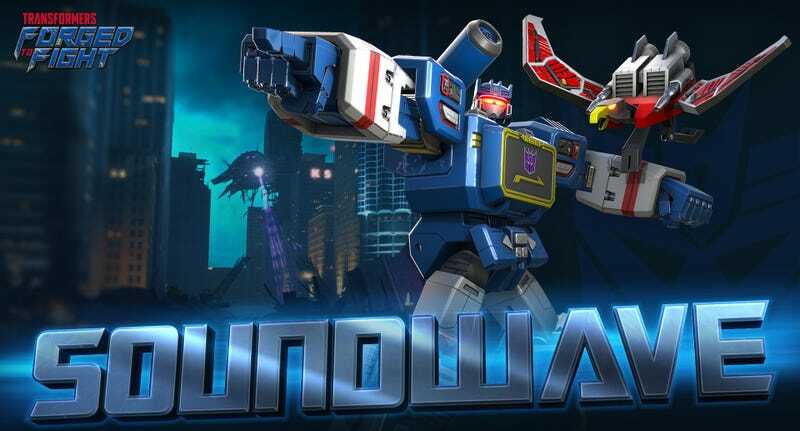 Random paid character drops in mobile games aren’t new, but I’m really feeling the burn in Kabam’s mobile fighting game Transformers: Forged to Fight. First I missed out on Beast Wars Waspinator. Now I’m not going to get Soundwave. Ugh. Because I love the Transformers characters and concept and the fighting isn’t too shabby, I’m willing to suffer through all the extraneous mechanics Kabam’s packed into Forged to Fight. But after missing out on one of my favorite characters and the prospect of another passing me by, my enthusiasm is starting to wane. First I spent the majority of a weekend fighting through arena battles for the chance to acquire Waspinator, the hapless insect and one-time Starscream’s ghost host body from the Beast Wars series. I sat in the bathroom (and probably other places) and did battle against other players’ teams, desperately trying to either earn crystals for a chance to unlock Waspy, or to place on the battle leaderboards. I did neither. Waspinator never gets what Waspinator wants. And now we have Soundwave. I spent countless hours talking to myself in Soundwave’s voice as a child, trying to nail down the metallic timber in his emotionless voice. I was so excited when I got the message that he was available in the game today, I spent $10 immediately in order to open a couple premium crystals. Thing is, Soundwave isn’t in premium crystals. A couple of hours after getting the message that he was available today, I got another message telling me he was exclusively available in special Soundwave-centric crystals. Fine. My mistake. I’ll just buy a little more. What’s $5? For one thing, $5 is not enough to open a Soundwave crystal. I ended up having to spend $10 for one chance. I activated the Space Bridge . . .
. . . and came up empty. I mean, I got a character, but it was movie Hound. So basically I came up empty. And that’s probably it for me. I’m not going to sit and battle through the arena again. There’s no way I’d reach the rank to win Soundwave, and the chances of scoring him in a random crystal are two low to justify the expense. I refuse to be a whale, even if that whale transforms into a giant robot and then combines with other sea-themed robots to form Oceanus.